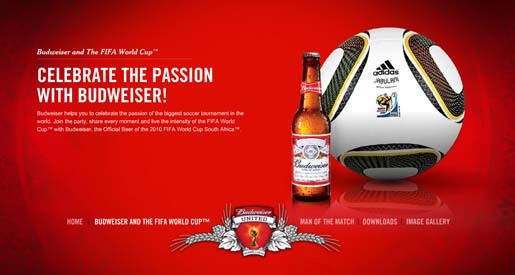 Budweiser sponsorship of the FIFA World Cup is providing Anheuser Busch many media opportunities, with the campaign combining Man of the Match naming rights, a reality-TV show style Bud House, and a range of commercials. The campaign, online at Budweiser, includes two commercials, “Penalty Kick” and “Swap”. The Budweiser “Man of the Match” program, launched on May 24, invites members of the public to vote on the best players of each World Cup match, online at www.fifa.com/man. 64 lucky fans will win the right to travel to the tournament and present the awards. The Global Beer Champions 6v6 Cup has evolved into an international amateur event featuring soccer teams from around the world competing in local grassroots tournaments. Bud House has brought together one fan from each of the 32 qualifying teams to stay together under one roof during the FIFA World Cup. 16 men and 16 women will share sleeping quarters based on their rounds, but will be eliminated as their football teams drop out of the competition. The last two fans will attend the 2010 FIFA World Cup South Africa final, with the winner securing international bragging rights, and the opportunity to present the Budweiser “Man of the Match” award to the World Cup finals Most Valuable Player. Bud House has its own YouTube channel, Facebook group and Twitter channel. The World Cup 2010 campaign was developed at DDB Chicago, by chief creative officer Bob Scarpelli, group creative director Barry Burdiak, creative director John Hayes, art director John Baker, creative director Dan Strasser, producer Richard Chambers, senior producer Scott Kemper, account directors Paul Matusczyk and Nick Vitellaro, and production business manager Kelly Lenthe. VFX and finish was produced at Filmworkers Club by colorist Michael Mazur, VFX artist Rob Churchill, executive producer Mary O’Gara. Editor was Grant Gustafson at Whitehouse Post. Sound was mixed at Another Country by Dave Gerbosi. Music, “Kings & Queens” was performed by 30 Seconds to Mars, Written by Jared Leto.